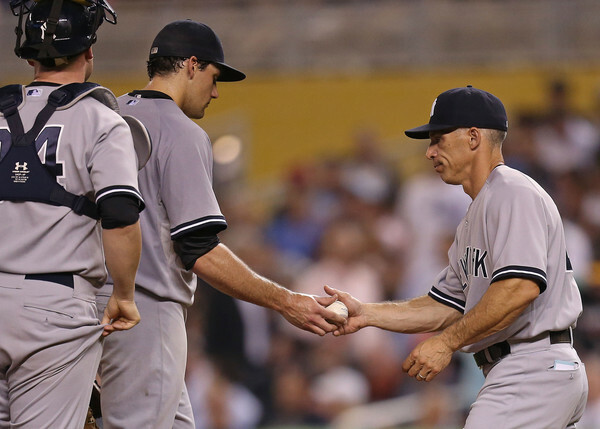 That is how many hitters New York Yankees’ starting pitcher Nathan Eovaldi retired in a row after allowing a freak lead-off double in the first inning of last night’s eventual 4-2 Yankees win over the Arizona Diamondbacks. The young righty had his top notch stuff as he practically coasted through the first six innings racking up 5 strikeouts and walking none with no signs of slowing down. And yet, despite his efficiency and dominance and a 3-1 lead, Yankees Manager Joe Girardi decided to yank Eovaldi after only 85 pitches to hand the ball off to his three-headed monster of a bullpen to close out the game. In a vacuum this move is understandable. The trio of Dellin Betances, Andrew Miller, and Aroldis Chapman is a bullpen the likes we have never seen before and Girardi can’t be blamed for relying on his biggest strength to at least win one game against the lowly Diamondbacks. This is the blueprint for how the Yankees wanted to win games this season and Girardi was simply sticking to the script by sitting Eovaldi down and letting the back end of his ‘pen do what it does best. But the move also reeked of desperation and fear. It showed how little confidence he truly has in any of his starters right now and how important every win is for his struggling team. Even in a game where his starter was cruising through 6 innings on only 85 pitches Giradri coached the game like it was Game 7 of the World Series, not really entertaining the idea of sending his pitcher out there for one more inning and saving one of his relievers for the next game. Fortunately for Girardi, the move panned out as the Yankees won, but not before Betances came in to walk the first two batters he faced before getting out of the 7th, and Miller hanging an 0-2 slider that was hit out of the park in the 8th to make it a 3-2 game before Chapman came in to close out the 9th. Had the bullpen not been able to close out the game, this article, and the screaming from the rest of the Yankee faithful, would be far louder today; his decision to yank Eovaldi questioned. Yes Joe. That is what they are there for. To close out close games. But the message you send to your young starter, that even if he dominates the entire game, that 6 innings is all he is going to get if the Yankees are up by 1-3 runs is not one that is likely going to sit well with him and it certainly does not instill any confidence. Had Eovaldi begun to show signs of tiring or vulnerability I would completely understand the move, but the fact that his excellent performance was still not enough to pitch into the 7th inning puts a negative cloud over what should be hailed as one of his best starts in pinstripes. On top of that, we have seen over the last two seasons Girardi has had a bad habit of over-using his bullpen throughout the season and wearing them down come August and September. The addition of Chapman to the already dominant bullpen duo of Betances and Miller was to avoid wearing down his oft-used relievers, but last night with Eovaldi throwing a gem, Girardi decided to use all three instead of letting Eovaldi pitch into the 7th and hopefully save another 20 pitches off Betances’ arm. 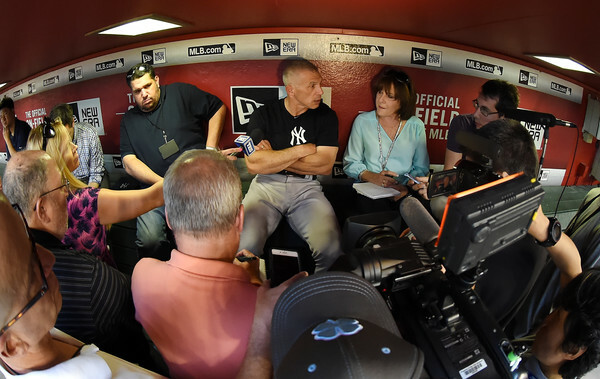 If Girardi coaches the entire season like he did last night, there is no way that these three will still be fresh come a hopeful division or Wild Card playoff push later in the year when they will be needed most. At the end of the day, the Yankees were able to pull out a much needed win Wednesday night to keep their season afloat, but if Girardi continues to coach like his job depends on it for the remaining three-quarters of the season, the Yankees could see their starters lose confidence in their ability to pitch late into games and their bullpen may begin to wear down and lose its dominance later in the year as in seasons past. At that point, Joe managing scared for his job could end up being the reason he is out of one come October. « Previous Article The Heavyweight Curse – Will Stipe Miocic be the First Heavyweight Champion With Multiple Title Defenses?